The docid is the parameter in document URL. Find the docid for your presentation and enter the doc id. 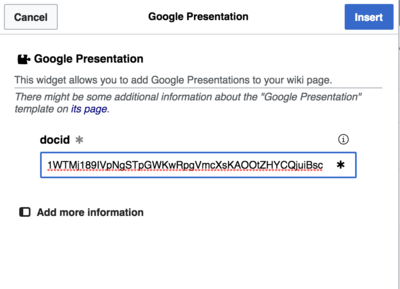 For example, if the URL of the presentation is https://docs.google.com/presentation/d/18PBCgIGhxHWR9KxeSnbSXClyVBob1vL-98orPuiOQIQ/edit#slide=id.p ,the doc id is the bolded part of the URL. 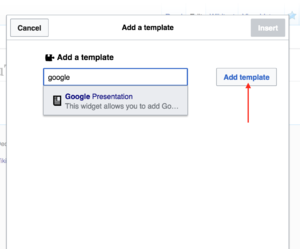 If you want to change the size of the Google slide, you can click on "Add more option" to change the size of the google slide. If you're satisfied with the option, click on Insert. After you insert the template, you will see a block of code that looks like "Start Widget.." . ignore the code and save the page. You're done! You have embedded Google slides to your page. This page was last edited on 18 December 2018, at 19:24.